The New Mobile version of your network now allows mobile devices to access your Ning Network much more effectively. The new mobile interface allows you and your members to view more features than ever, including the Latest Activity feed, Status Updates, Forum, Blogs, Photos, Groups, and Events. You’ll also notice that we’ve added a new tab on your Dashboard under the Settings section. From the new Mobile tab, you’re able to manage your mobile pages, make a number of other adjustments to fine-tune design elements and add analytics code to track visits to your mobile site. Let’s take a look at how some of the most-used features will now appear on a mobile device like the iPhone. 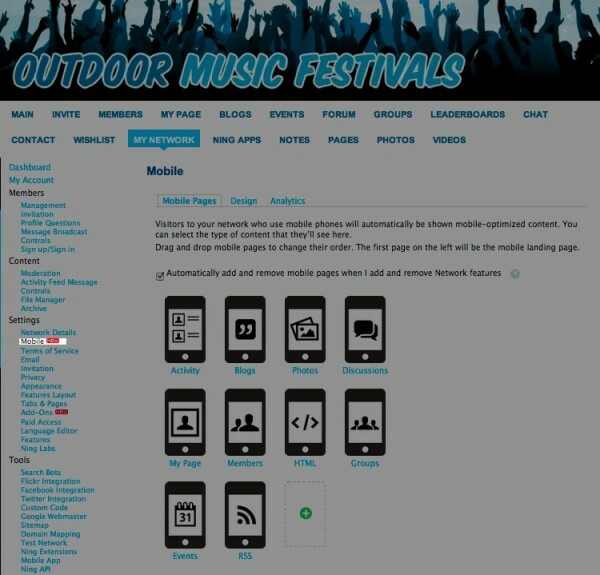 You can view the different pages that you’ve selected for your mobile site by clicking on the drop-down menu located in the upper right-hand corner of the screen. Click the + signs below to expand content. 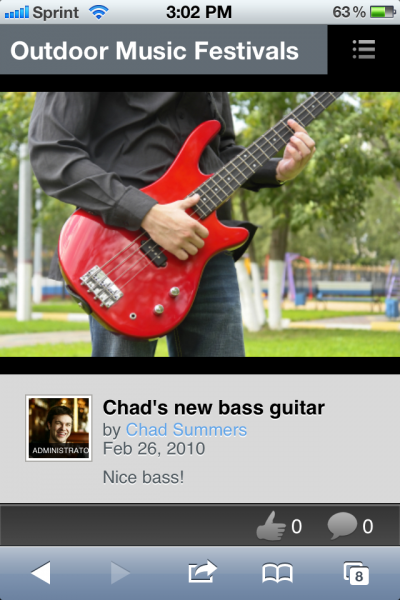 You can post statuses, share statuses, “like” content and comment on a status in the Latest Activity feed. To refresh the feed, just click on the arrow button located at the bottom of the footer. As the Network Creator, you can also choose to delete a status from the feed by using the ‘trash can’ icon located on the status detail page. To share a new status in the Activity feed, click on the ‘pencil’ icon located in the bottom right-hand corner of your screen when you are visiting the Activity Feed page. You can also choose to share your status update with Facebook and Twitter by selecting either option when you post. If you change your mind, simply click on the ‘Cancel’ button to go back to the Activity feed. You can view a list of the discussions on your network, add new discussions as well as like and reply to them. To add a new discussion, click on the ‘+’ button icon located in the bottom right corner of your screen. On the Blog page, members can add new blog posts as well asÂ like and comment on existing blogs. The Blog detail page will display the Blog’s description and the comments that members have left. To delete your Blog post, simply click on the ‘trashcan’ icon located in the bottom right-hand corner. 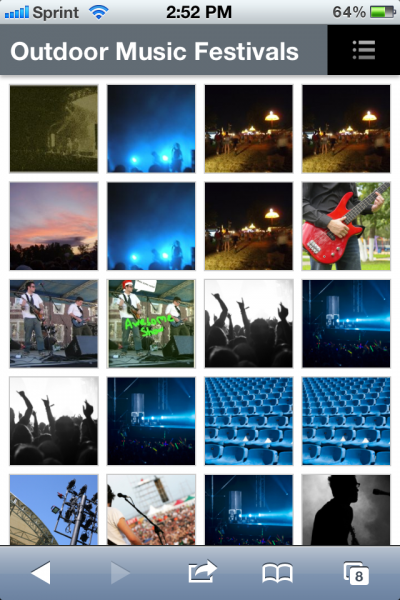 The photos page on your new Mobile version will display all public photos on your network. You can click on individual photos to see their detail pages and to like or comment on a photo. To see an individual photo in a zoom detail-view click on the photo a second time. 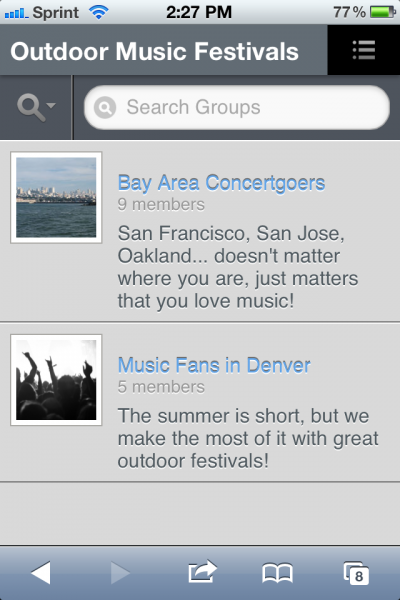 The Groups page will display your network’s Groups and also allow you to search for Groups. 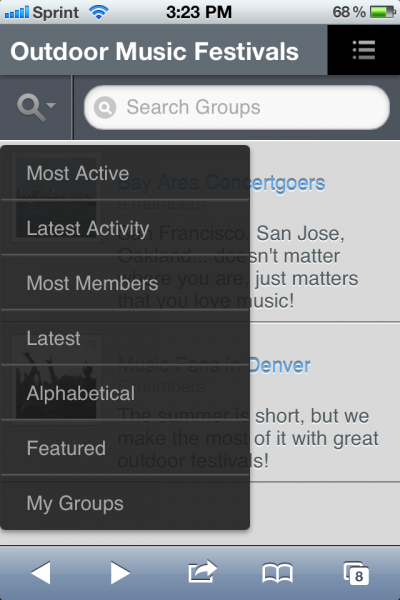 For more search options, click on the ‘magnifying glass’ icon to search by the following criteria: Most Active, Latest Activity, Most Members, Latest, Alphabetical, Featured, and My Groups. 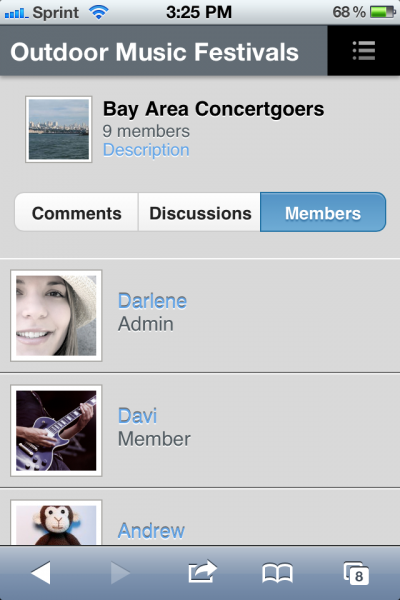 On the Group detail page, you can view the comments, discussions and members that belong to the Group. 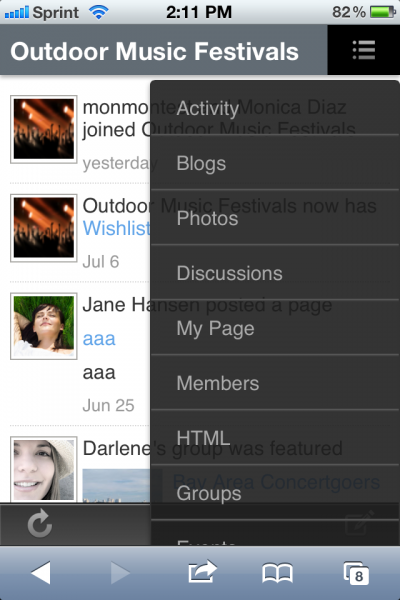 You can also join a group by clicking on the ‘+ member’ icon located in the bottom right corner of your screen. 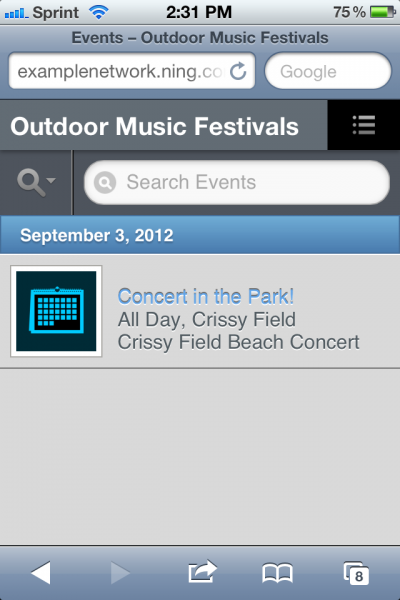 Members can leave comments on the Event’s wall, RSVP via the mobile interface and respond to invitations. You can also view your My Page and members’ My Pages on the network. 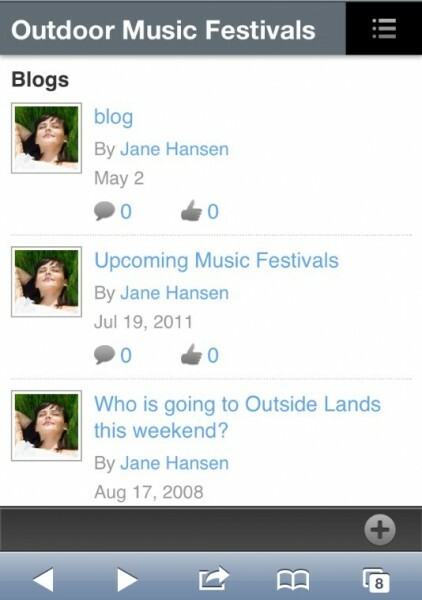 Note that these profile pages will only display profile questions, the profile photo and the comment wall. If you’d rather view your network in the full-page version, simply select the ‘Desktop View’ option from the ‘list’ icon drop-down menu.